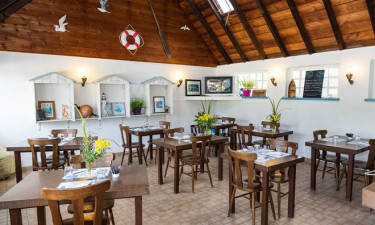 Set right on the coast of the beautiful Brittany region of France, Port de la Chaine is a leading LuxCamp that has been designed with the needs of guests firmly in mind. 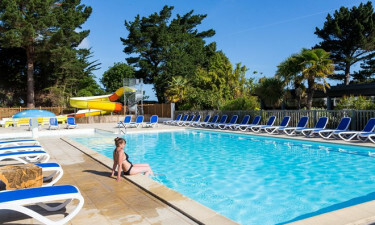 While the main highlight here is the close proximity to one of Brittany’s most stunning beaches, guests will also find that site itself offers an excellent range of amenities and facilities to make use of. People who are looking for a premier luxury camping experience are sure to love taking part in the outdoor sporting activities on offer. 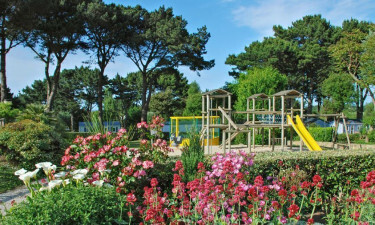 Activities such as table tennis and volleyball take place in a large and picturesque garden, which also boasts a special children’s play area. Why choose camping Port de la Chaine? People who choose to stay at Port de la Chaine will find a stunning sandy beach just a short stroll from their spacious mobile home. This stretch of sand runs for a little over two miles, meaning that visitors will find plenty of space to spread out and soak up the sun. This luxury camping site also comes complete with its own indoor and outdoor swimming pools, which are surrounded with sun loungers for pure relaxation. Special sporting activities are often arranged here so that guests can get fit and have fun during their camping holiday.